German Artist Otto Schubert has earned a place in cultural history as one of the 112 artists included in the infamous Entarte Kunst (Degenerate Art) show, organized in Munich in 1937 by Nazi Propaganda Minister Joseph Goebbels. This sham-exhibit singled out 650 pieces from among the thousands of “Bolshevik-Jewish” art objects, confiscated by the Nazis from museums across the Third Reich, and mockingly displayed them beside demeaning graphics like “An insult to German womanhood” and “A mockery to God.” The show drew over two million visitors. No doubt, many viewers came to see what would now be considered an outstanding collection of Modern Art, including works by Marc Chagall, Wassily Kandinsky, Paul Klee, Oskar Kokoschka, Piet Mondrian--and Schubert. The life and art of this German painter, book illustrator, and print-maker were intimately connected with Dresden, the Saxon city once dubbed “The Florence on the Elbe” for its beautiful Baroque architecture and lavish art collections. Schubert was born in Dresden and pursued his artistic career there. He studied at Dresden’s School of Applied Arts and the Dresden Academy of Art and found work painting sets for the Dresden Hoftheater (better known as the Semper Opera House). He witnessed the city's destruction in World War II, and died there in the years when Dresden and its wartime ruins served as an anti-imperialist "exhibit" for the Communist regime. Dresden was a center of German Expressionism, associated with Die Brucke (the Bridge), a 1905 movement, which took inspiration from African and Oceanic art in developing new forms of emotive, non-naturalistic imagery. Schubert represents the second wave of expressionist artmaking in Germany. He served in World War I, sending an extraordinary series of postcards from the trenches to his wife, Irma. Schubert was seriously wounded, and like many from this "lost generation" of artists, he returned in disillusionment from the front. He wanted to make more politicized art than the original Die Brucke circle and joined with Conrad Felixmuller and Otto Dix in forming the Dresden Secession Group 1919. The creative ferment of the interwar years came to an end, when Hitler came to power. Schubert's art was suppressed by the Nazis, and he endured the suffering, deprivation, and loss of World War II along with his beloved home city of Dresden, which was targeted by British and American Air Forces in a massive incendiary bombing raid in February 1945. The resulting firestorm laid waste to the city center. Schubert’s wife was among the tens of thousands killed in the air raids, and his studio and a large part of his works were destroyed. Schubert managed to rebuild his career from the ashes in the 1950s, helped by his second wife. He found a niche for himself in the arts scene of Communist East Germany, primarily, as an illustrator of children's books. This was a common refuge for Central and East European artists of the pre-war generation who could not give their whole-hearted support to the Socialist Realist aesthetic of the Moscow-dominated, authoritian regimes in the region. Schubert's prints and drawings appeared in editions of Aesop’s Fables, Gulliver’s Travels, Grimm’s Fairy Tales, and Reinecke Fuchs, Johan Wolfgang von Goethe’s version of the famous Reynard the Fox stories. Schubert was interested in religious subjects all his life. 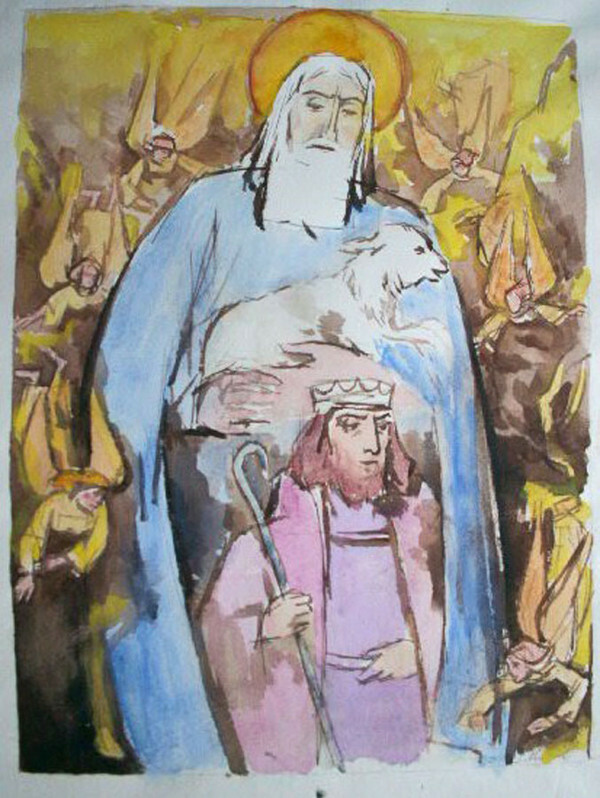 His personal archive contained watercolor sketches and ink wash drawings on biblical subjects, not intended for public display during the Communist era, when sacred themes did not meet with official approval. 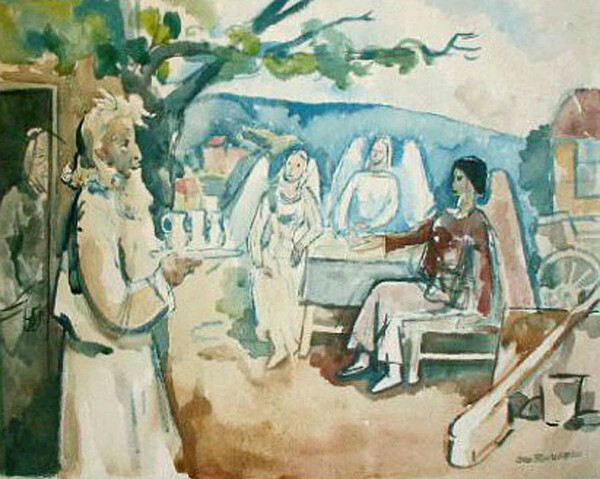 The five now in the Sacred Art Pilgrim Collection depict The Three Guests of Abraham, The Lord is My Shepherd, The Annunciation, and The Supper in Emmaus (in two variations with working sketches.) There are also five woodcuts on view from what appears to have been a series on the life of St. Francis of Assisi and four linocuts with episodes from the Passion of Christ. A fourth linocut, Teach Us to Prayer, shows the influence of folk art prints, which helped inspire a revival of the graphic arts among the German expressionists.